The EcoHitch® hidden hitch for the 2009-2015 Mini Cooper S EcoHitch is designed to be completely concealed so you only see the receiver once it's installed rather than having to see an unsightly crosstube underneath your vehicle, and has as much flair as your Mini. Rated for 300 pounds tongue weight and 2,000 pounds towing weight, this Cooper S EcoHitch won’t make you have to choose between items to take on your next adventure in your vehicle. *If you’re going to be towing and need trailer wiring, click here! Ensure your wiring harness does not drag on the ground by visiting our Eclipse trailer wiring bracket. This hitch only fits the vehicles above. Mini Cooper must have center mounted dual exhaust, with the muffler running parallel to the length of the car. With the Mini Cooper S, you are getting a highly-engineered Turbo engine with ferocious handling, so shouldn’t your hitch be just as turbocharged as your car? You need a trailer hitch for your Mini Cooper S that cannot only keep up with your Mini, but make it seem as if they were always meant to be together. Made from recycled, eco-friendly materials, we’ve created a perfect complement to your car with this hitch for the Mini that won’t compromise on style or performance, only the EcoHitch receiver is visible when installed. 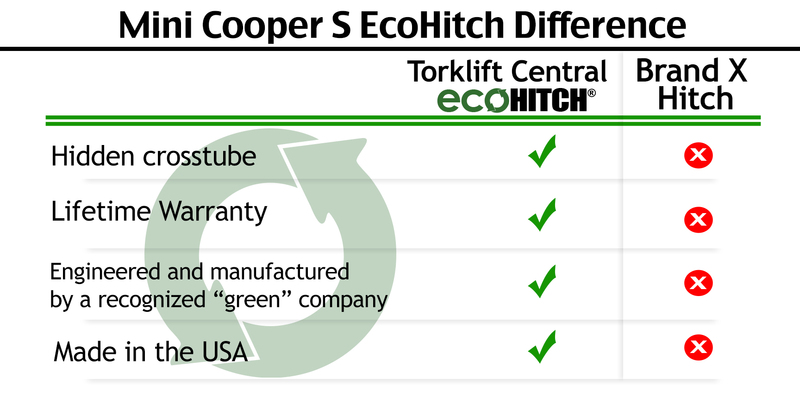 The EcoHitch® hidden hitch for the Mini Cooper S is engineered to meet stringent national SAE J684 standards and comes in 1¼-inch receiver. With 300 pounds tongue weight and 2,000 pounds towing weight capacity, our lightweight hidden hitch helps give you room for more so you can live a fuller life with adventure without having to compromise on storage space or leaving items behind. *Minor modification of factory exhaust hanger is required.